Preheat oven to 425°F. Line a baking sheet with a silicone baking mat or spray the baking sheet liberally with cooking spray. Set aside. Combine the olive oil, garlic and rosemary in a medium-size mixing bowl. Add in the butternut squash and season with salt and pepper to taste. Toss to coat. Place in single layer on prepared baking sheet. Roast for 15-20 minutes, stirring once during cooking time. The squash is ready when it is fork tender and caramelized. There are two keys to perfectly roasted veggies: First up, keep your oven temperature high to really caramelize the sugars in your veggies. Between 400°F and 450°F is a good range for roasting. Secondly, don’t crowd your veggies in the oven by packing them too tightly onto your pan. Give them space to breathe on the baking sheet. If you don’t, you’ll steam your veggies instead of roasting them. There are many varieties of squash. Acorn squashes are shaped like their namesake the acorn, can be green or orange and when cut in half make the perfect vehicle for tasty fillings. The spaghetti squash is oval in shape, mild in flavor and when cooked its stringy insides mimic noodles. Lastly, the butternut squash in this recipe is a bell-shaped, winter squash that grows on a vine. It has a creamy but very dense center so make sure to cut the squash into even, bite-size, cubes to ensure it cooks through and you are not left with undercooked chunks of squash. 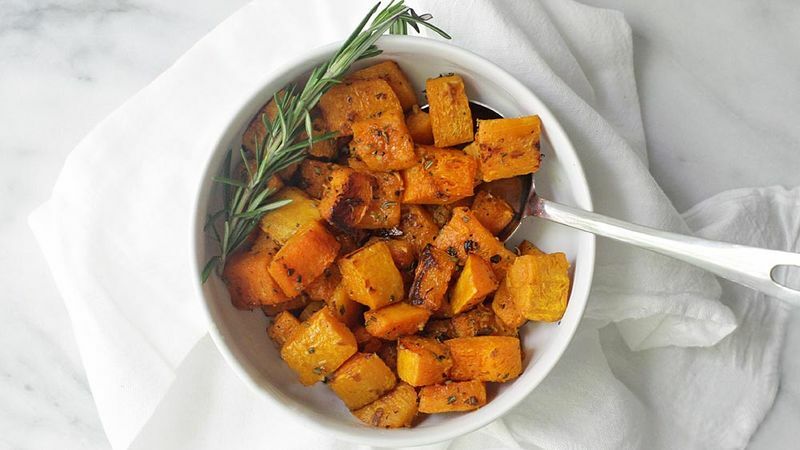 See our other tasty recipes for these squashes and more.